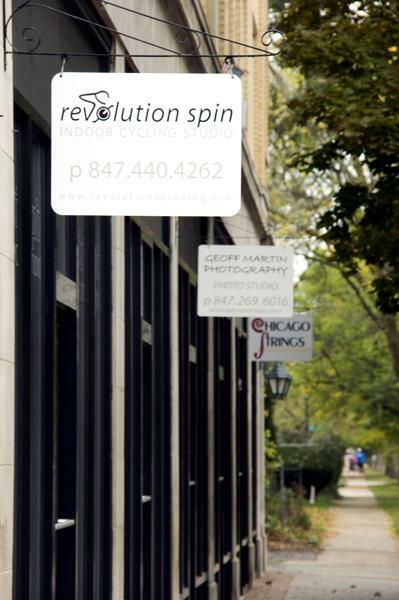 Revolution Spin is an indoor cycling studio located at 904 Sherman Ave. in Evanston. An Evanston resident filed a petition with the city to revoke the business license of the studio. A dispute between two Sherman Avenue businesses has escalated in recent days, with one owner petitioning the city to revoke the other’s license to operate. Martha Moser, owner of Moser Sewing studio, filed a petition on the website www.change.org that has since received 99 signatures. Moser said the neighboring business, Revolution Spin at 904 Sherman Ave., is making too much noise and causing a disturbance in the neighborhood. A spinning studio that moved to Evanston in October 2011, Revolution Spin utilizes loudspeakers to play background music during workouts and instructors use megaphones during classes. Next door, separated by what Moser called a “paper thin” wall, Moser Sewing studio is a “quiet” crafts business that offers sewing classes. Jason Bressler, owner of Revolution Spin, claims that he has not conducted classes outside the restricted hours of the Evanston noise ordinance. Use of sound-producing devices is restricted from 10 p.m. to 7 a.m. Sunday through Friday and from 11 p.m. to 7 a.m. Friday through Sunday, according to the ordinance. The earliest class Revolution Spin offers is a 7 a.m. “1000 calorie burner” class on weekdays and a spinning boot camp at 8 a.m. on weekends, according to the Revolution Spin website. City officials are currently verifying Moser’s allegations and checking whether Revolution Spin is complying with city ordinances, said Steve Griffin, director of Evanston’s community and economic development department. The city is meeting with the cycling studio to see if any soundproofing can lessen the impact on Moser’s business. “Hopefully we can work it out between everybody,” Griffin added.